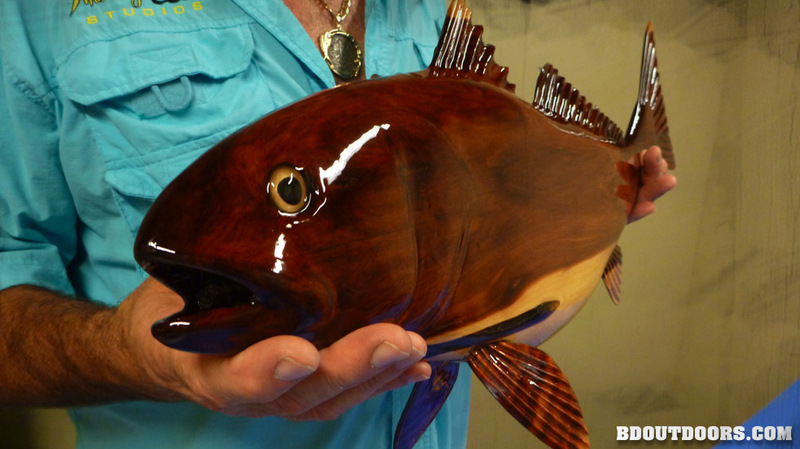 BD introduces Doug Snider, custom wood carver from Central Florida. 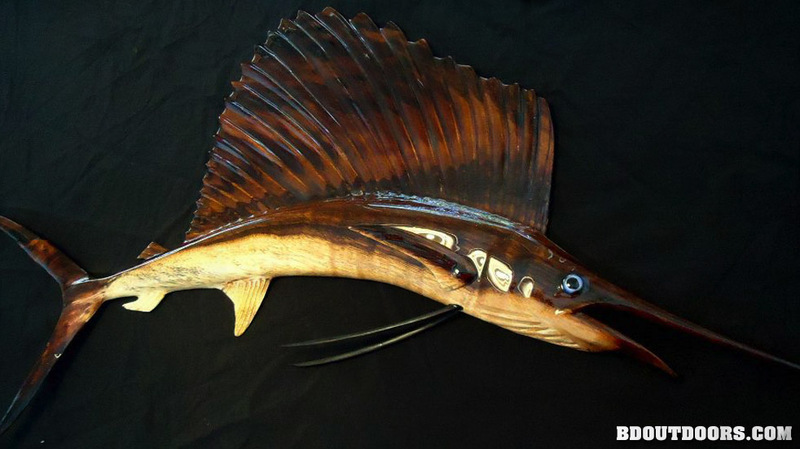 He creates life-like sculptures from the salvaged pieces of wood he collects and is a highly sought after fish carver. 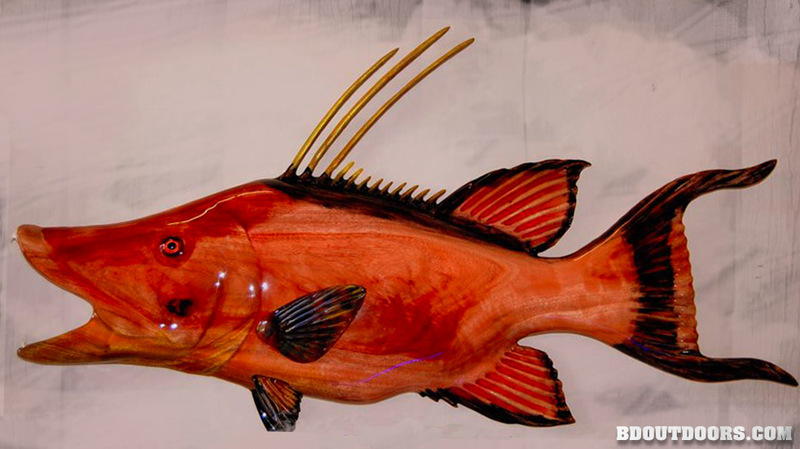 This carving of a hogfish is what caught my eye one day on Facebook. Turns out this artist was only a few miles away from my house, so I paid him a visit. 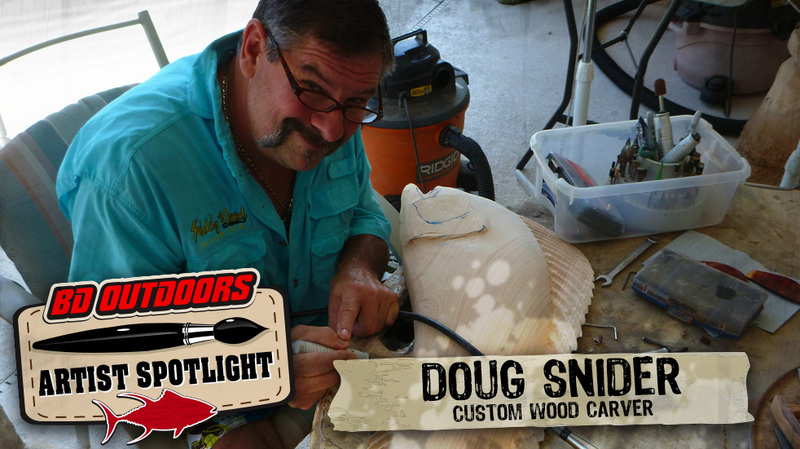 Meet Doug Snider from Port St John, Florida. 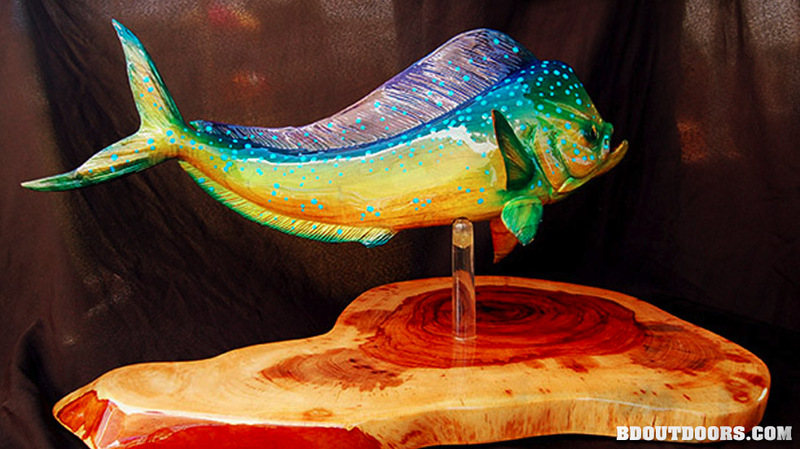 A retired safety inspector from the NASA shuttle program, he now pursues his passion of creating amazing fish carvings from many types of wood. 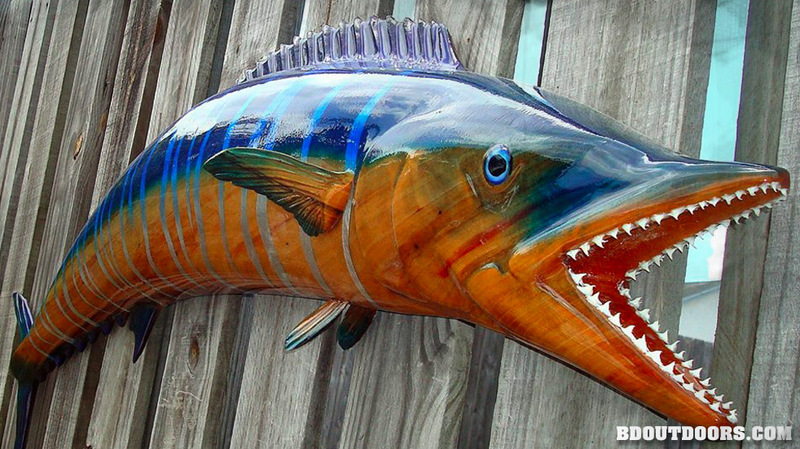 His talent is plainly seen in this colorized carving of a wahoo. 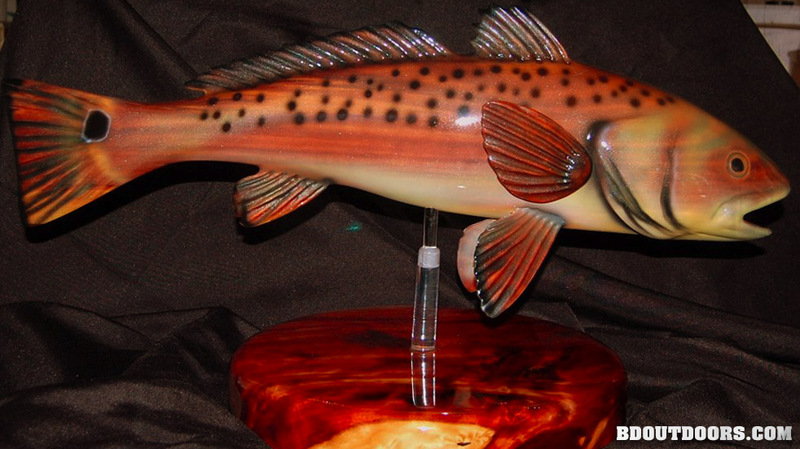 Doug often makes replicas of fish as a trophy mount out of wood. 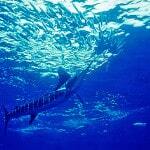 This sailfish is one of a set of carvings that has been commissioned to be placed in a glass top table. 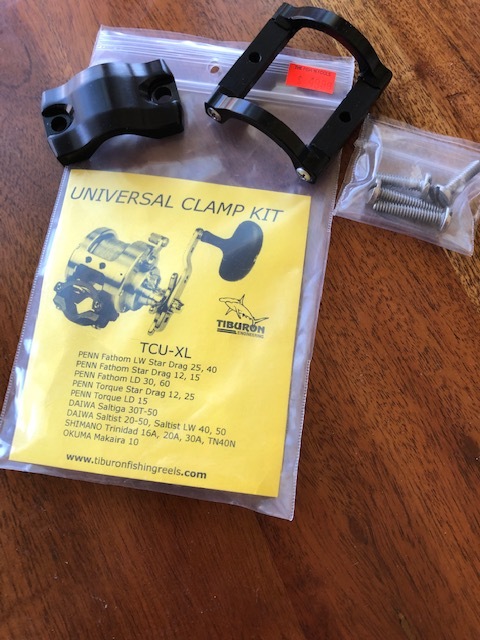 Doug is also well versed in various epoxies and has developed a unique method of imbedding the carving in epoxy. He is then able to add led lights and other accents to make an amazing end product. 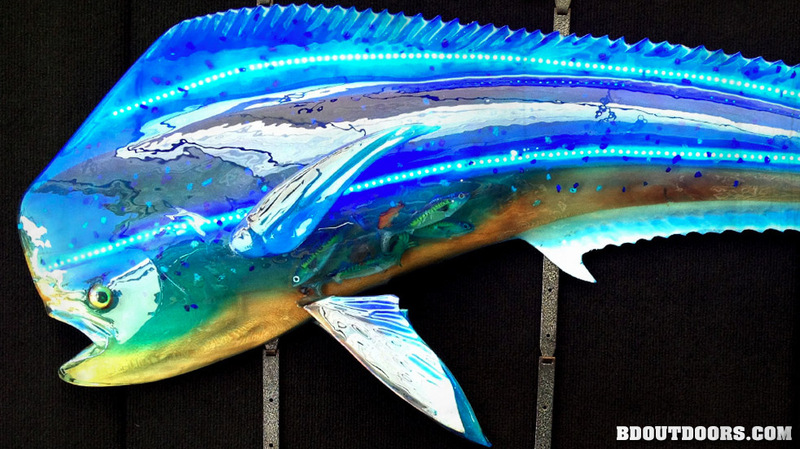 This dolphin glows in the dark with blue led lights. So cool! The detail of each carving is painstakingly put in by hand with mechanical and small power tools. Layer by layer is removed to reveal the artist’s vision within the plank of wood. 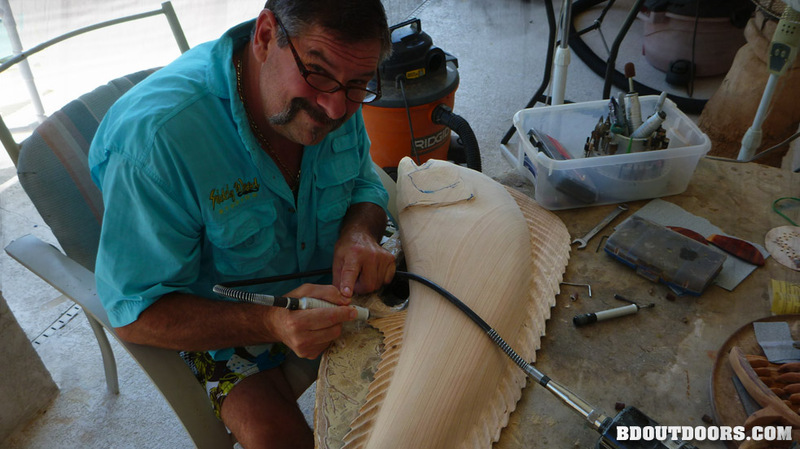 Doug often donates his time and talent to create trophies for events with a worthy cause. Speaking of vision, Doug could see the end result when he picked up this ball of tree roots. 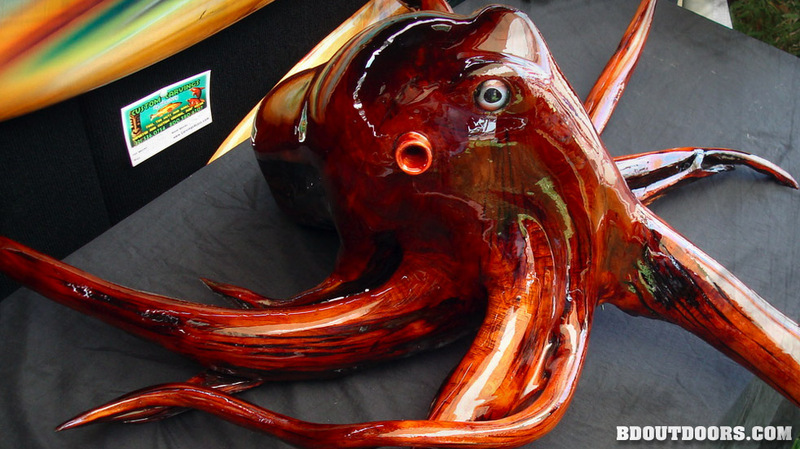 Most of his carvings are planned around the natural grain and characteristics in the wood. 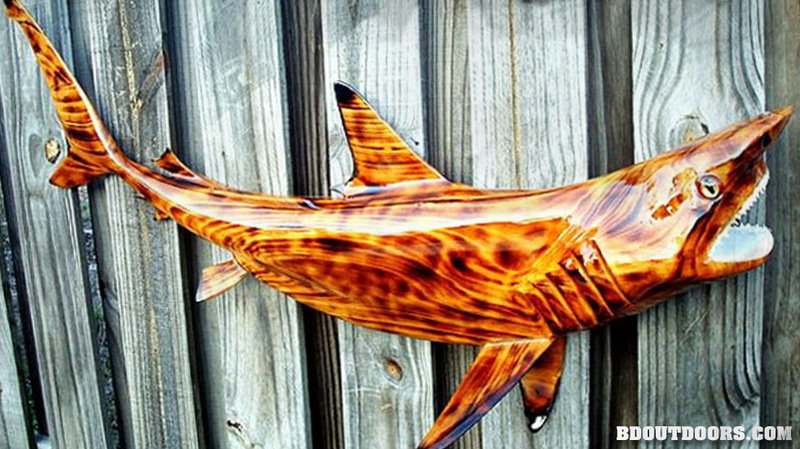 The pattern in this shark is all from the reclaimed wood it was carved from. 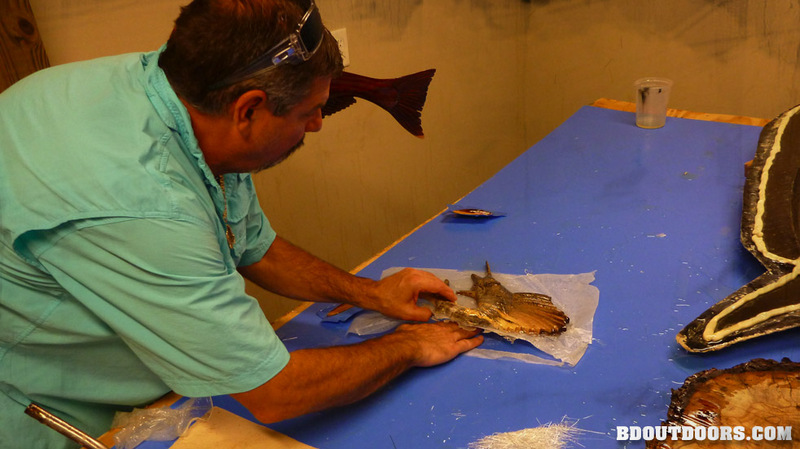 This is a wooden redfish mount in progress. 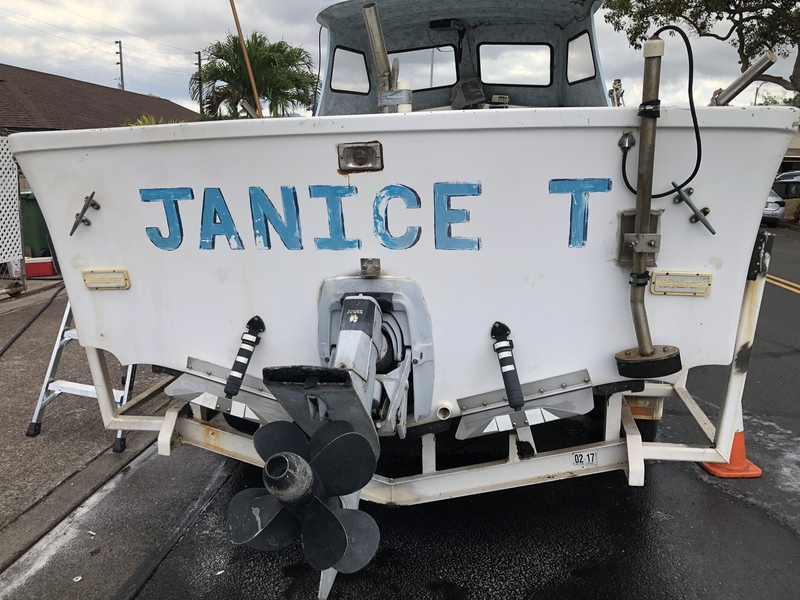 Finishing touches like fins are about to be added. 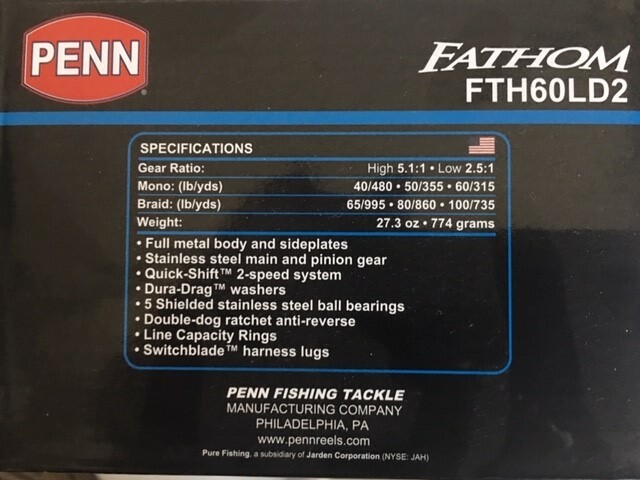 The color breaks in the fish are all natural. 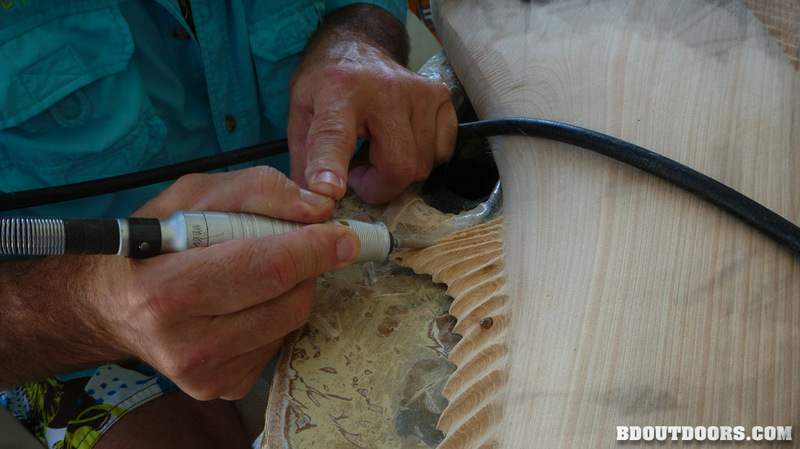 Here Doug is infusing spalted wood with epoxy to stabilize the soft material enough to work it. It sometimes brings out amazing colorations in the wood. 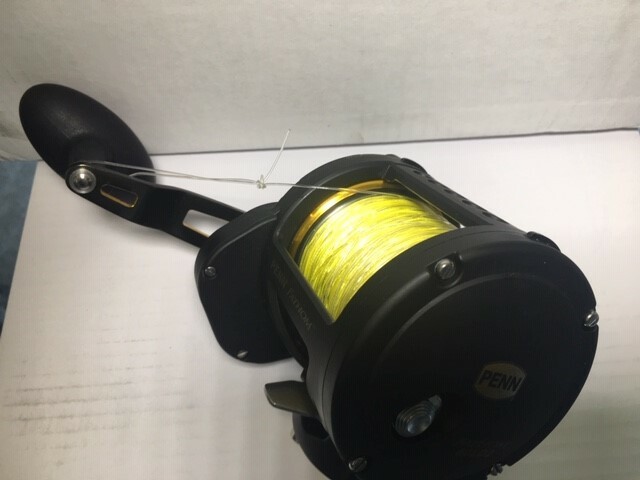 A custom redfish mount that had 100 spots for a local fisherman. Thats something to be proud of. You can get more info at his FaceBook page for Snidely Wood Studio. 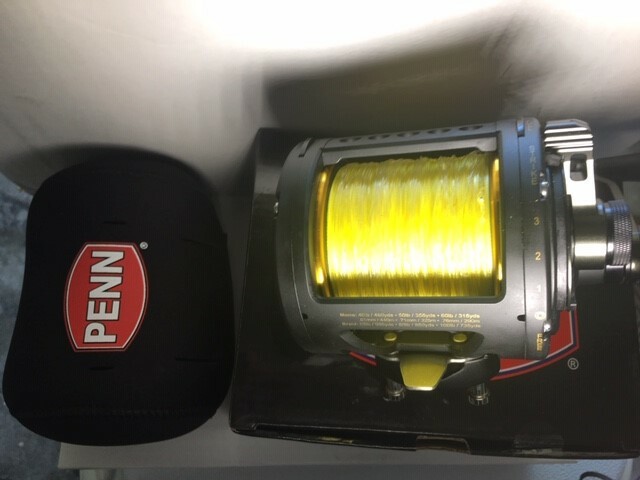 All Kinds Of Luck Ordinarily, anglers aren’t in a big hurry to get to trolling when the boat leaves port.